Mx5 , SLK280 or the Stag. What is a guy to do. It just occurred to me I have 3 hairdressers cars lol. Is the question how to choose which one to take or which one to get rid of.....? 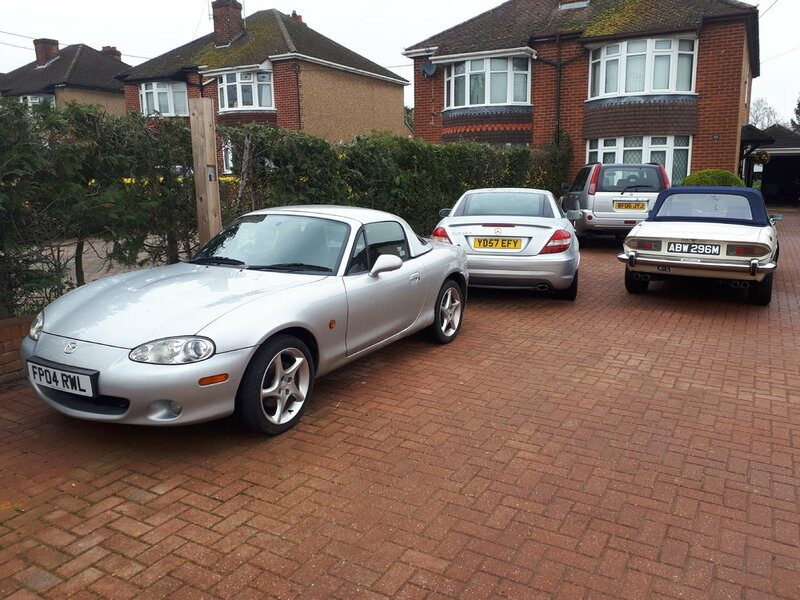 I had to choose the Mx5 to sell. Although the Merc isn't as much fun around corners the folding metal roof and AC makes it a great all rounder. Obviously the Stag is a keeper. I can't believe how clean your drive way is. Front garden don’t need much mowing....... good thinking! Yes, shell is all aluminium. About 1700 kg IIRC. 300 bhp and AWD...... 6.9secs to 60, but just keeps on going after that........ accelerates like a jet on take-off run - relentless. I never found the end of it...... or even close...... as apparently they are limited to 155...... And this was a well-used and somewhat distressed example. The S8 (D2) has 365 bhp and is shorter geared so 0 - 60 in 5.4 seconds. If I had another it would be the 2.8 2WD. Only 193 bhp but also only about 1450kgs, so still respectably rapid (low 8s to 60) and just as good at wafting around. A work colleague has a 1500 Maxi that leaks like the Amoco Cadiz. She reckons its where the gear shift cables go into the gearbox and has shown me photos of past owners bodges to fix it.